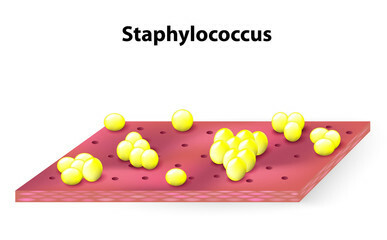 Staphylococcus is a group of bacteria that can cause diseases as a result of infections of various tissues of the body. It is a bacterial infection of the urinary tract, usually sexually transmitted. Usually accompanied with pus discharge and painful urination. Staphylococcus is more familiarly known as staph. Staph-related infections can range from being not severe and requiring no treatment to severe and potentially fatal. It results in a localized collection of pus, known as an abscess or boil. No vaccine is known to have the ability to prevent staphylococcus and the prevention of staph infections mainly requires paying attention to the risk factors that may increase the likelihood of getting a particular type of staph infection. Avoiding close skin contact with infected individuals as the disease could be transmitted. Skin infections are mainly treated with antibiotics and the choice of antibiotic depends on the type and severity of the infection as well as drug-resistance patterns of the particular bacterial type. Prevents and protects the body against infections. If you have staph-related illness, contact me to get any of the recommended products and get it cured within days. Also, you can comment below and I will get back to you as soon as possible. Thanks for the compliment, Mathias Amodu. I research very well so as to serve people better and save lives. Duration of staph treatment actually depends on the kind of infection and disease the person has. It differs as some do not take long to heal while some could occur for a long period of time. Thanks for visiting Sound Health Doctor. If you have any other question, feel free to ask me.